We will be undergoing renovations starting March 25th thru April 25th. Renovation working hours will be weekdays 9am to 5pm. Thank you for your patience and understanding. Located just minutes from downtown McMinnville, Red Lion McMinnville boasts one of the most enviable locations among pet-friendly hotels in McMinnville, OR. 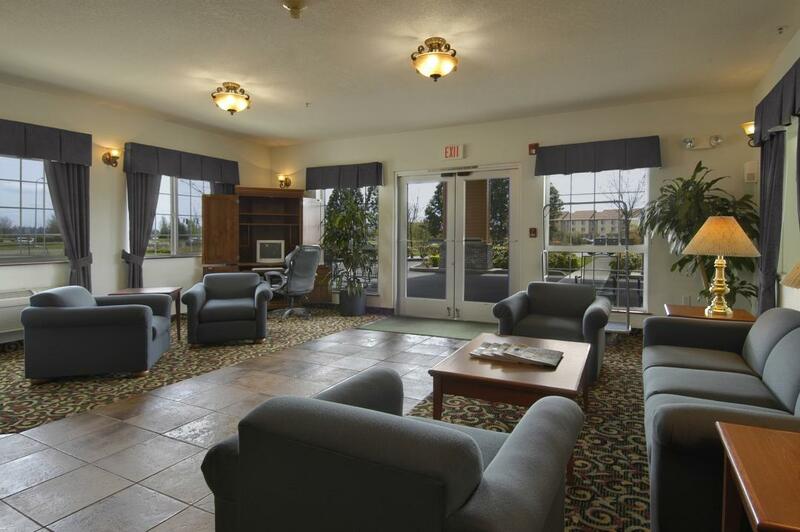 Enjoy a peaceful wine country getaway in one of our 67 cozy, yet spacious accommodations. Start your mornings in McMinnville with our complimentary breakfast and an invigorating workout in our fitness center. Take a dip in our indoor swimming pool and relaxing whirlpool. If you're staying with us for business, take advantage of even more on-site amenities, including a fully-equipped business center and 1,300 square feet of multi-use meeting space. Ours is one of the best value, full-service hotels in McMinnville in the heart of Oregon Wine Country. Pet-friendly hotel rooms ($15 charge per stay). There are a limited number of pet friendly rooms. Please call the hotel to confirm a pet friendly room. Explore the majestic city of McMinnville with a trip down Highway 18 or Highway 99W to discover our beautiful beaches and championship golf courses. Sample local wines at the 35 nearby wineries in the Willamette Valley. Experience the most popular attractions in McMinnville, OR and take in the sights from new heights on a helicopter tour of the lush Oregon Wine Country. Located in the heart of Willamette Valley's wine region, Red Lion McMinnville offers great rates on 67 pet-friendly accommodations with some of the best McMinnville, Oregon lodging amenities available. Wake up in the morning to the smell of our signature complimentary breakfast and a quick work out in our fitness facility. Enjoy an invigorating swim in our indoor pool or soak away your worries in our relaxing whirlpool. Our lodging in McMinnville, OR offers 1,300 square feet of multi-faceted venues for conferences, meetings and special occasions. Spend a night with us and take advantage of our top-notch McMinnville, OR hotel amenities. Pet-friendly rooms ($15 fee per stay). There are a limited number of pet friendly rooms. Please call the hotel to confirm a pet friendly room. Take a trip to Willamette Valley's wine country and enjoy the comfort of Red Lion McMinnville's accommodations and amenities. 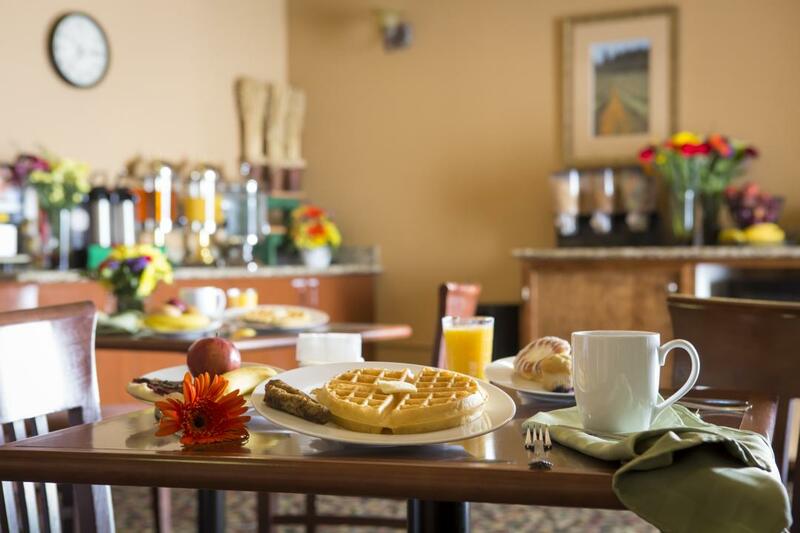 Wake up to some of the best breakfast available among hotel restaurants in McMinnville, OR -our complimentary breakfast, served fresh every morning in the Harvest Room. Although our Willamette Valley hotel does not feature an on-site restaurant and you would like to sample some local flavors, we've compiled a list below of our favorite McMinnville restaurants. Known for their signature organic chicken hash and white gravy, Crescent Cafe is the place-to-be for brunch. But beware, this local favorite gets crowded fast. One of the most popular restaurants in McMinnville, OR, McMenamins serves Northwest classics, enticing seasonal entrees and homemade daily specials in a warm and welcoming atmosphere. Visit this charming and historic building to dine with spectacular views of Third Street on the best rooftop bar among McMinnville, OR restaurants. The Old Oak is an upscale sports bar equipped with high-definition televisions, pool tables, bar games and a mouth-watering menu. Third Street Pizza Company is a pizza joint and movie theater all in one. After 5:00 pm, stop by for dinner and a movie with a delicious beer or cocktail. Boutique & Rare Oregon Wines available as a stand-alone flight, or with your lunch or Brunch meal. Retail bottle and case sales. Great winemakers at exceptional prices. Pair it with a great lunch, so you don't have to stop your tasting tour! A lively, casual atmosphere for all ages. Stop in for your morning latté, bring the whole family in for breakfast, or settle in for a leisurely lunch and savor the comfort of the thriving community that gathers here throughout the day. Check out our serious food with a casual menu from a spectacular rooftop view. Grab your kids, call your friends and come out to the 1882 Grille to experience the feel-good atmosphere focused on food, family, and fun. Situated in the heart of Willamette Valley's wine country, Red Lion McMinnville serves as an ideal destination for unparalleled McMinnville, Oregon events with 1,300 square feet of meeting space -featuring the latest technology and complimentary Wi-Fi. Whether you're traveling for business or a local seeking meeting space in McMinnville, OR, consider our contemporary, full-service hotel for executive gatherings and conferences of up to 75 guests. Our professional event planners will ensure that no detail goes overlooked. Red Lion McMinnville is one of the top business-friendly hotels in McMinnville with affordable rates on 67 spacious accommodations, equipped with pillow top beds, complimentary Wi-Fi, ergonomic work stations, eco-friendly bath toiletries and other modern amenities. With one of the most enviable locations among McMinnville, Oregon hotels, we also provide easy access to the best dining, shopping, and Willamette Valley wine tasting in the area. Whether you're just traveling through for business or hosting a corporate gathering in our 1,300 square feet of meeting space, make sure to take advantage of everything McMinnville has to offer as well as our convenient and relaxing amenities - including our complimentary breakfast, fully-equipped business center, state-of-the-art fitness center, indoor swimming pool and whirlpool. Centrally located in Willamette Valley's famed wine country, Red Lion McMinnville serves as the ideal destination for action-packed business trips, family vacations, and romantic getaways. From award-winning Willamette Valley wine tastings to world-class shopping, there are always things to do in McMinnville, OR. Start your day of adventures with our complimentary breakfast, then check out some of our favorite attractions in McMinnville listed below. A favorite among local golfers since its opening in 1964, Bayou Golf Club is a 9-hole, par 3 course -featuring a full length driving range; a practice area for chipping and putting; and a pro shop fully stocked with drinks and snacks. From June through October, visit the McMinnville Farmer's Market for wine tasting, live music, crafts and fresh local produce -including dairy, fish, fruits, meats, vegetables and even flowers. Linfield is a private institution that hosts ongoing educational conferences, international fairs and sporting events within the Northwest Conference. Located only two miles from Red Lion McMinnville, Third Street -the main avenue of Downtown McMinnville-offers wine tasting, boutique shopping, an array of delicious restaurants and even a world-famous ice cream shop. In 2011, Willamette Valley Vineyards was rated one of the Top 100 Wineries in the World. Visit their sleek tasting room to try some of Oregon's leading Pinot Noirs. There's nothing better than a signature Willamette Valley wine tasting. Kids can slide out of a real Boeing 747 aircraft on the roof of Evergreen Wings & Waves Waterpark. The waterpark is an indoor, all-season educational waterpark that includes ten water slides, a wave pool, and a hands-on museum dedicated to teaching students about the power of water. Throughout the building, visitors learn about the power of water and its effects on society through interactive exhibits and learning tools. Both the Waterpark and its inspiration, the Evergreen Aviation & Space Museum are excellent places for your children to learn and have fun. This family-friendly attraction is the perfect place to spend an afternoon during your stay at our McMinnville hotel. With displays ranging from the Wright Brothers' early aeronautic designs to an actual Lockheed SR-71 Blackbird that can fly at speeds of over 2,000 miles per hour, the Evergreen Aviation & Space Museum showcases the history of aviation. Our McMinnville hotel is just a short trip from this excellent aviation museum. The centerpiece of their aeronautic exhibitions is the original Spruce Goose. Built entirely of wood because of wartime restrictions on metals, this massive airplane is a symbol of American industry during World War II. The Evergreen Museum celebrates innovators, pilots, and veterans who pioneered flight in these remarkable machines. If you're planning a trip under 3 hours, the Evergreen Museum is perfect for you. You'll be able to see the Spruce Goose Cockpit, Titan II SLV missile silo, the SR-71 Blackbird, and the WWII Aircraft area within that time, all of which are fascinating in their own right. If you're lucky enough to get an entire day dedicated to the Evergreen Museum, you'll have time for the Aviation and Space building exhibits, in addition to the above attractions, plus a 3D movie, Cafe time and a trip to the Museum Store. Families with children will delight in the number of kid-friendly attractions at the Museum, including the Space Museum Playground, Aviation Museum Kid Zone, Biplane Carousel, and the 3D Theater. Visit the Museum site and check out all it has to offer. 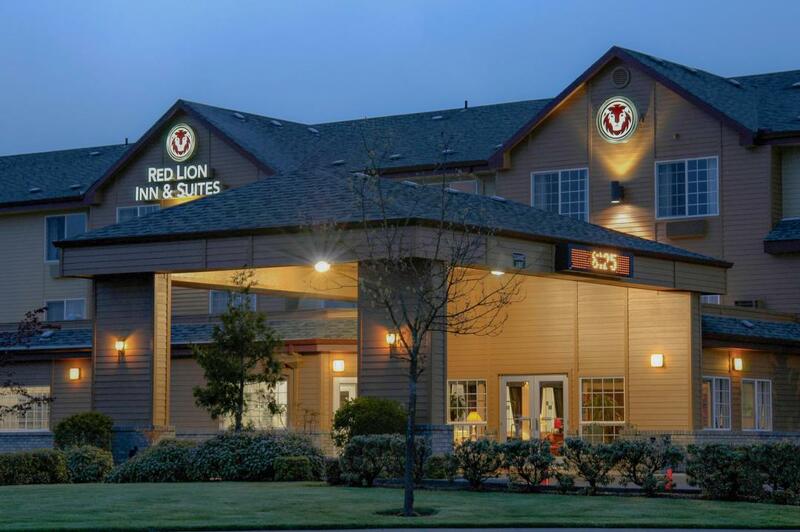 Situated off Highway 18, Red Lion McMinnville offers great rates on 67 spacious accommodations with easy access to family-friendly McMinnville, Oregon attractions. Start your mornings with our complimentary breakfast, then embark on a family adventure with our list of the most popular McMinnville, Oregon activities for kids below. 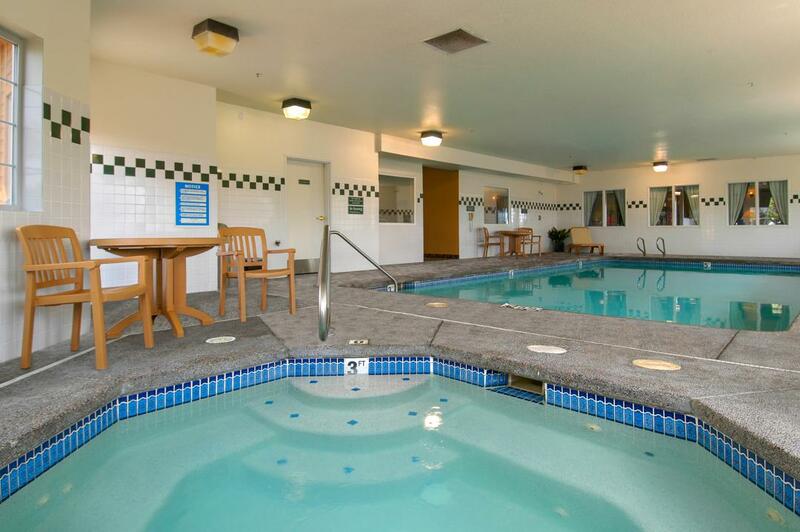 After a long day of escapades, return to our hotel for more exciting times in our indoor swimming facilities and get ready for another day of exploring attractions in McMinnville. Evergreen Aviation & Space Museum features a variety of private planes, military jets, helicopters, space flight vehicles and even firearms as well as Howard Hughes's infamous Spruce Goose. Visit this aeronautics museum and learn about the thrilling lives of legendary innovators, pilots and veterans. The Annual UFO Festival & Alien Parade is a costume parade established in honor of the 1950 "Trent Sighting." Sip on some "Alienator Ale" at this two-day gathering as you enjoy live music, model spaceship displays and a pet costume contest. Located in the Evergreen Aviation & Space Museum - Wings & Waves Waterpark is a year-round indoor water park, featuring a café, leisure and vortex pools, a play structure, an H2O museum and water slides for all ages. The Yamhill Country Fair & Rodeo is the oldest Country Fair in Oregon held every month of August. Join the fun with great food and entertainment -including rodeos, demolition derbies, 4-H and FFA competitions, live music and more. Based at the McMinnville Municipal Airport, Konect Aviation offers scenic helicopter tours over the vast Oregon countryside. Get the chance to look down on the beauty of Multnomah Falls, the Columbia River Gorge, Portland Downtown and Willamette Valley wine country, as well as the Oregon coastline. Whether it's celebrating a wedding, a one-of-a-kind vacation, or just to experience the thrill of flight over the unforgettable Pacific Northwest, book a flight with Konect, and marvel at the sights and sensations. Konect offers helicopter tours taking off from McMinnville, Portland Downtown and the Salem Airport, with a number of pre-planned tours beginning at $49 as well as the opportunity to customize them. Choose from flights taking you above the Oregon Coast and Vineyards, to the Columbia River, Mt. St. Helens and beyond. Looking for an incomparable experience near our McMinnville hotel? Take to the skies, and make plans to fly with Konect scenic helicopter tours today. Situated off Highway 18, near Highway 99W, Red Lion McMinnville is conveniently placed near some of the best things to do in McMinnville, including McMinnville shopping. Shop until you drop with great rates on our plush accommodations and easy access to the finest shopping in McMinnville, Oregon. Check out our favorite McMinnville shopping hot spots below and return to Red Lion McMinnville to enjoy our indoor swimming pool, whirlpool and other relaxing amenities. Set in an 1893 mercantile, La Belle Casa is a charming boutique shop offering fun and unique gifts for everyone and every occasion. Liquid Lights Glassworks is a specialty shop for handmade glass and marble art. Visit this low-key gallery to witness the amazing art of glass-blowing from start to finish. Located in downtown McMinnville, Third Street boasts some of the best fashion boutiques and specialty stores for shopping in McMinnville, Oregon. Visit Redberry Boutique for one-of-a-kind accessories made by local artists and craftspeople. Find high-quality clothing and hand-milled French soaps at Mes Amies. Or stop by NW Food & Gifts for handcrafted soaps, art, jewelry as well as amazing food and wine tasting. Founded in 1966, Eyrie Vineyards is the first vineyard in the U.S. to produce Pinot Gris. Visit this vineyard to taste the best Pinot specialties in Willamette Valley, including Pinot Noir, Pinot Blanc and Pinot Meunier. Join us for "one of the most enjoyable wine weekends in the world" at the International Pinot Noir Celebration. For three fabulous days, savor the finest Pinot Noir and Northwest cuisine with some of the most renowned winemakers, chefs, epicures and oenophiles in the world. Originally a power plant, Panther Creek Cellars now serves as one of the most unique wineries in Willamette Valley. Catch an insider's glimpse of the wine making process in a special wine tasting experience among oak barrels and fermentation tanks. Specializing in Pinot Noir, Pinot Gris and Brut sparkling wine, R. Stuart & Co. is one of the few Willamette Valley wineries open past the normal 5pm closing time. Visit their spectacular tasting room in downtown McMinnville for special events, tastings and dinners with guest chefs.